Most patients who have completed one or more virotherapy courses and were being interviewed for Rigvir® testimonials had surgery, chemotherapy or radiotherapy as their initial type of treatment. According to them, Riga virus injections were well tolerated and made them feel as if they were dealing with flu rather than a serious disease because there were no or very mild side effects. The medicine helped them fight primary tumors, as well as metastases spread throughout their bodies including liver and lungs. 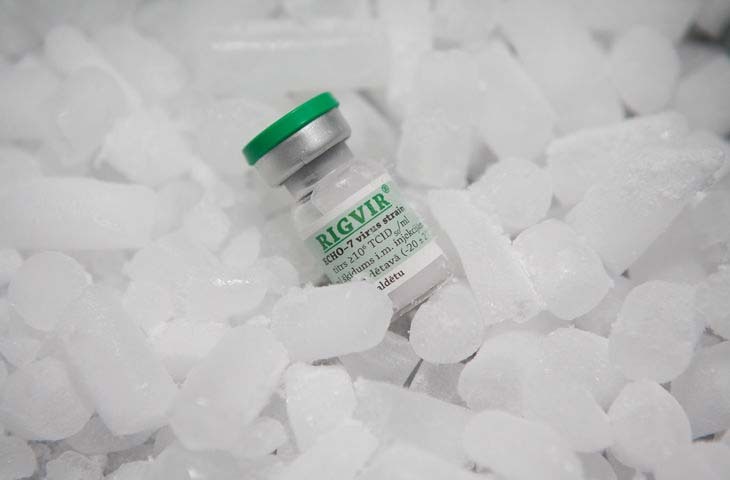 Rigvir® scans your body for malignant cells and destroys them from the inside. For many, empathy and care that doctors approach their patients with become crucial. And because most visitors arrive in Latvia with their spouses or friends, their companions feel the same. Also, patients highlight that peaceful scenery of the Baltic Sea with plenty of fresh air, delicious meals prepared based on their health needs, and various specialist sessions including acupuncture make them feel like home if not better. To cut down to the essentials, let’s watch these six inspiring true stories about patients from across the globe and their experience with Rigvir treatment in Latvia. Testimonial 1. Nadine (the UK) with metastasized malignant melanoma since 1999: “Virotherapy is non-toxic. I can do my therapy at home and still play with my children”. "My name is Nadine and I am from the UK. And at the moment I am just trying to stay well basically. I have two young children, seven and twelve. Well, I had melanoma removed in 1999, which I had removed from my upper arm. I didn’t have a recurrence for 10 years until the birth of my youngest child and that was in 2009. And since then it has got progressively worse. And it has affected lots of different parts of my body. I’ve had radiotherapy, chemotherapy, lots of operations. Until finally I had the virotherapy and found out about coming to Latvia. So that is where I met with it at the moment. It is safe, it’s non-toxic and totally different from anything that you are offered in the UK. In the UK there are only a couple of treatments that you can have. And all of the time they are just offering you surgery. So if you have a lump or a bump, they just cut it off. So I was running out of options basically. In London again when I’ve had, you know, I’ve had lots of surgery and so I’ve been made a bit of a guinea pig with various vaccines and things like that. But I know it’s all chemical, it’s all toxic and I just think my body is under enough of pressure as it is. So I know that the injection I am having with virotherapy is safe, is non-toxic. It has no side effects. I can do my treatment at home and still get on with the day, still play with my children. I haven’t got to lay down for hours, I’m not going to be ill. So it has given me a good quality of life. I like the idea of coming here for a week, and the way that you treat people or the illness as a whole-person approach, a holistic approach. So, it’s not just treating a tumor. It’s your food, your mindset and things like that as well. So when you leave here, you feel set up to do on lots of different levels. This is my third virotherapy and I do one week at home, which is nice for me as well. Because treatment back in England you know… You could go to the hospital every three weeks, you have to wait a long time for results and answers, whereas I may control of this, I can do my injections at home. If I have a lump or a bump, that comes up I inject around and I would say in the last year the virotherapy by applying around a lump or a bump has taken it probably around 5 lumps down. Yeah, it’s amazing. So, I feel I am in charge of my treatment. Yeah, so it has been really good. I just googled it after watching the TV programme, after the documentary. And I came out here for consultation. And I just fell in love with the place. It is so pretty and it’s a nice setting, fresh air. Everyone here at the clinic is amazing. It is just so different to what I am used to having in the UK. So, things are discussed very clearly with you here, your blood tests and things like that. In London, it is almost like you are not there. When people discuss your results or your treatment, you are just a number in a book you know. But here everything is discussed clearly - your food, your lifestyle, its supplementation and that sort of things. It is totally different. I would totally recommend it. Although my condition is still very very serious, I mean I’m sitting here with tumors on my lung, my pancreas and various other lumps and bumps here and there. But I do think it gives me a quality of life, I think it keeps everything at bay. To come out here I think it just gives you a new sense of hope and it definitely works, it definitely helps. And hopefully, I will get out of that. I came here when I wasn’t feeling very good. After seeing all of the various therapists and the doctors and everyone else, and when I left I did feel totally amazing. And when I had my CT scan when I went home, I had a big tumor on my lung, which we were thinking of doing radiotherapy on. And by the time I went home after three virotherapy injections and a week of doing this holistic approach the tumor was totally gone. And also I found the support even from England on the phone. If I need to ask the doctor anything, what they recommend. I was in the hospital recently and I could phone from the hospital and I get to speak to the doctor directly straight away. And again in England that doesn’t happen. This is my third time back here and I just feel at home here. This time I have come alone, which was a little bit scary, but everyone has looked after me and made me feel welcome. And they have looked after me very well. When you get a diagnosis, it’s very scary. But I think first of all do not listen to mainstream doctors. I think look outside the box. I think the doctors that I am in contact with in London, for instance, they are treating a tumor just as a tumor. They are not treating you as a whole person. Okay? 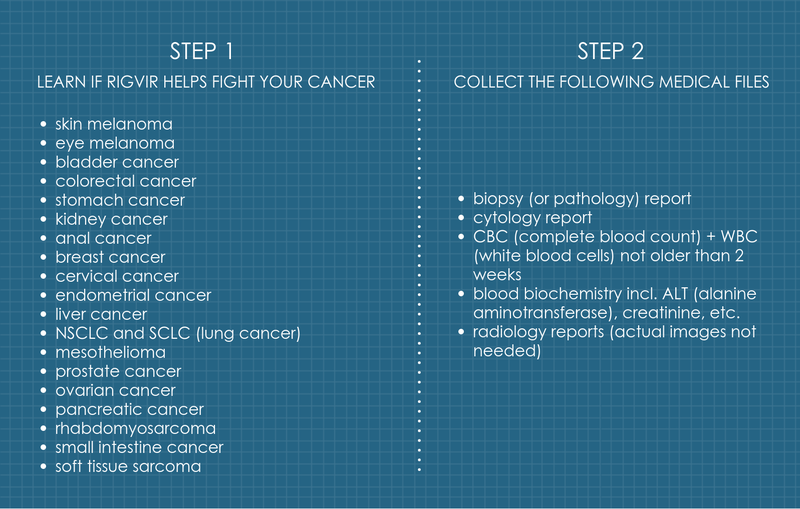 There’s more to that end result of a tumor than… It doesn’t just come for no reason. So I think, you know, look for alternative treatment, for safer options, look after yourself properly and you can get all of the advice here - nutrition, psychotherapy, acupuncture and things like that. So you are not just bombarding your body with toxic things, that are going to make you feel worse. I know that there is hope. There is always hope. I am eight years with a serious malignant melanoma diagnosis. It has metastasized all of my body. But I am still here, I am still smiling". 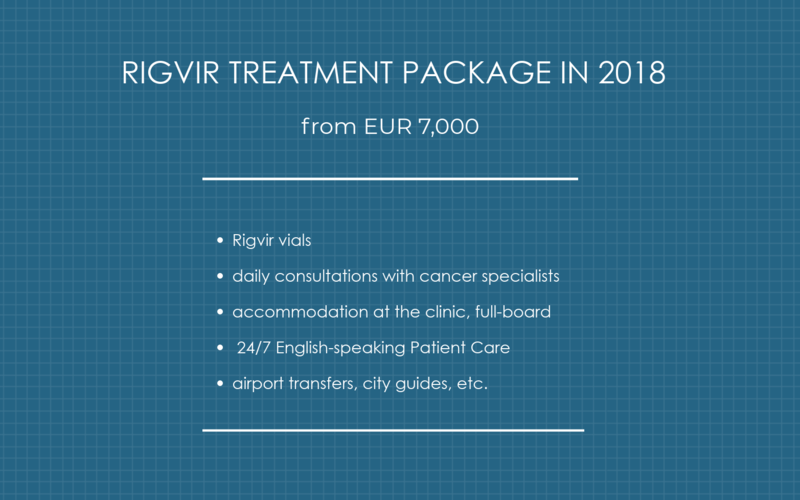 To learn how to qualify for virotherapy for British citizens, read Rigvir in the UK. When stage IV melanoma was diagnosed with hepatic metastases after unsuccessful chemotherapy, she visited Latvia to receive virotherapy treatment. “I had an injured mole, it was in summer 2012. Then within a short period of time, it turned into a malignant formation creating hepatic metastases. It seemed, that there was no possibility of treatment or surviving. When a doctor told my mom, that she had at best one year to live, my world collapsed. From February 2013 she has started treatment with our virotherapy until now. In general, she feels good, stable, lives her daily life without significant changes. “It’s my only treatment, no other methods. Only virotherapy injections. People do great work here. Maybe the humanity will appreciate it with time. It’s a virus, that is not harmful to the body and is rapidly discharged, no side effects. It destroys only the sick cells and restores the functioning of immune system. Testimonial 3. Zane (Latvia) with melanoma stage 1: “I hadn’t heard anything about virotherapy. I expected my hair would fall out and that I would lose lots of weight. I’m very proud that after using this medication I gave birth to a healthy baby”. “My name is Zane, I run a small shop. I was diagnosed with stage 1 melanoma. The melanoma was surgically removed, but up until that point I had a normal life. I didn’t notice anything strange about myself, but my family doctor noticed it in 2013 when I visited her for an unrelated illness. She spotted an unusual mole on my leg and then two weeks afterward when the results of the operation were known they informed me, that I had stage 1 melanoma. For about one week after the operation things were peaceful and then the oncologist called and said, that I had to go to the oncology center where I was prescribed virotherapy. Until then I had no idea what it was, because, like most people, I thought that malignant tumors and their treatment meant, that my hair would fall out and that I could die. I hadn’t heard anything about virotherapy. I expected my hair would fall out and that I would lose lots of weight. But it’s been a positive experience as I took a look at myself in the mirror every morning and saw, that my sink wasn’t full of hair. I felt like I didn’t have any limitations and that I could keep living the way I had before. I felt really good. My life didn’t stop. I didn’t have any restrictions. I was immediately prescribed virotherapy. In the first month, I received three injections and this continued for half a year. The original plan was to continue with the treatment for a longer period of time, but my husband and I wanted to have another child. When the oncologist discovered that I was pregnant they convened a council of physicians. After analyzing the results they wished us the best of luck and gave their blessing. They agreed, that the pregnancy could come to term and the virotherapy was suspended. I am very proud that after using this medication I gave birth to a healthy baby. There is no doubt also women without children have also been diagnosed with melanoma that are afraid, that they won’t be able to have children. They might think, that they can’t have a complete life. I have a healthy child and she is living proof that it can happen. We succeeded. Everything is fine. You can’t give up. You should try everything that life has to offer. Even if there are doctors that give up on you and say that nothing can’t be done, you have to keep fighting and look for other opportunities that are available in the 21st century. Live for today, live in the now and live for yourself". "And I said to them: “I am going to Riga. And the first doctor said, “Oh, you can die of this!” And I said: “ Look here.” And then I gave him some papers from this and he was interested. He said: “Why haven’t they told us this?” I said: “I don’t know”. And then 2 or 3 days later I was to talk with an oncologist, he was only a doctor. I talked with her, she was very nice and she was interested too. And she helped me with some papers I should use for the doctors here. She was very helpful, printed out. And she said: “Write those letters. They will understand”. Fantastic! I am very glad to be here. People are so fantastic here and they do so much for me. I have got some metastases after starting with Rigvir this node was bigger. And after that again in January-February, it got bigger. But today it has gone the other way, gone back. So it is good news. "Back when I was still employed I noticed that this birthmark was oozing. I was scared and didn’t know what was happening. The first surgery was unsuccessful and the professor told me that he touched a few nerves and blood vessels but did not cut out everything. Than this melanoma appeared. I felt unwell sometimes with no strength and problems with my breathing. I often went to walk along the seaside with my wife. We had a special route but there was one occasion where I simply couldn’t walk. I didn’t know what was happening. I felt as if my heart was being squeezed. I visited professor Muceniece once a week for testing and she always adjusted the treatment. After starting the treatment, I began to feel well again. I felt fine for one year, then two years, and during all of this time I have done routine and major work, you know. Very major work. When I started feeling better I started to swim and take part in sports. I was still employed back then. I felt very good. Better and better. I still control my health and if I had visited professor Muceniece again, she would have helped me. Maybe this arm would still function normally and I would still be active, I would still be in shape. Because I spent all my life taking part in sports". Testimonial 6. Egidijus, melanoma: “I didn’t have any side effects or any evidence about severe treatment process… everything is as it was before the disease”. - Good afternoon, my name is Egidijus Kazlauskis. I am from Klaipeda, Lithuania. - How did you find out that you have an oncological disease? - It was very unexpected, as the disease itself. It happened 5 years ago, I returned from mountains and I had pain in my left arm. Probably I got some trauma during the mountain climbing and had pain in my left shoulder. I went to my doctor to find out what can be done. She is a very good doctor, very careful. She asked me to undress so she could listen to my lungs and look at my back - maybe I have traumatized it with a backpack. She discovered something she didn’t like on the left side of my back. Some kind of a black spot, it wasn’t greater than the tip of a pen. It wasn’t bleeding and didn’t disturb me, I didn’t worry about it at all only occasionally it was rubbing against a backpack. She told me to visit the Department of Dermatology across the street and get checked there. I went there, one doctor told me he can freeze it with nitrogen. But it must have been a kind of luck, he advised me to visit another doctor for a second opinion. The second doctor looked at the spot and told me that I must find a surgeon because the spot must be removed, it was malignant. So I had a surgery after a few weeks, the surgeon said he tried to cut and “clean” everything. However, it continued for a whole year. I needed 4 more operations, the disease continued to come back, they found metastases in my lymph nodes. It continued until the moment my friends who worried about me a lot found a newspaper article about a doctor, a dentist who suffered from melanoma. She had received treatment here in Riga and was using Rigvir. So we went to this dentist, a very kind woman, she remembered about the doctor Aina Muceniece, who treated her with Rigvir in Riga. When we called Riga to find a doctor, they told us that unfortunately she had already passed away, but there was another doctor Dite Venskus. - What exactly was the diagnosis? - And what kind of treatment did they offer to you? - I had immunotherapy, I needed to administer the medicine into the abdominal cavity, probably called drug name omitted, I do not remember already. It was difficult, I didn’t understand many things. You know, that none of the cancer survivors remember anything good about the disease or remembers very rarely. Thank God now it is starting to change. After drug name omitted, I had a fever at nights. And there were also surgeries. In the beginning, I had this fantastic feeling, because I didn’t need any serious investigative techniques, didn’t need to take all kinds of biopsies. The doctor took my blood test, looked and said, that she can help me. -How did the treatment go? - I don’t know what to tell about treatment. I have a feeling, that there was no treatment. I didn’t have any side effects or any evidence about the severe treatment process. It all went according to schedule, the doctor made a scheme. It was interesting. I could make the injection into the buttocks by myself, but under the shoulder blade I couldn’t. So I had to ask my family. Some of them didn’t know how to do it, and they were afraid, that they would shed a single drop of this valuable and life-saving drug. And now I can say, that my friendship with Rigvir and the doctor lasts for already 4 years. What can I say, I work, I don’t feel anything, all the tests are good, half-yearly I do ultrasound scans and thank God everything is as it was before the disease. - How would you evaluate your treatment?. - What much can I say? I hope more and more people will find out about Rigvir and it will help them. Testimonial 7. Jane (the USA) with ocular melanoma: "I chose not to do the conventional therapy in the United States."